I have a new feature that I put in PDE that I’m requesting feedback on. I need feedback soon since I will disappear and bury myself in EclipseCon preparation and also be vacationing in Whistler, BC for a week. 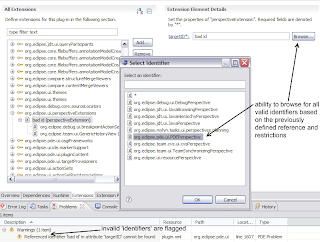 In the picture above, I’m working with the ‘pespectiveExtensions’ extension point. If you’re familiar with this extension point, it allows you to extend perspectives defined in other plug-ins. 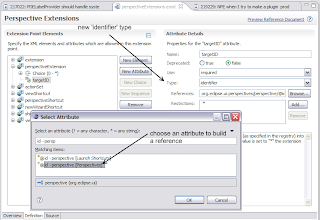 It lets you do this by referencing the id of an already defined perspective, but this suffers from the magical identifier problem in Eclipse. To help with this issue, I’ve modified the pespectiveExtensions extension point to have its ‘targetID’ field be of type ‘identifier’ and be based on perspective ids (in simple terms). Now, instead of the ‘targetID’ field being just a string, it becomes hyperlinkable along with a ‘Browse…’ button that when clicked, displays all the valid identifiers for this attribute (in this case, it’s all the perspective ids found). On top of that, if you notice in the Problems view, identifiers that don’t belong will be properly flagged with a warning. Thanks to Paul Webster and Remy Suen for motivating me to finish this feature.